Indus Flotilla was the name of a company which was established in 1859 and used steamers and barges to run cargo through the Rivers of present day Pakistan. In the absence of decent roads and railway, the rivers of Pakistan provided a means of transportation all the way from Arabian Sea to Northern Punjab city of Makhad (District Attock). The first ever steam boat that sailed in the River Indus was in the year 1835 and it was named as ‘Indus’ . In 1843, two more steamers were used and their names were Planet and Satellite and they took part in the British Military Operations associated with the conquest of Sindh province. After the occupation of Sindh was complete, a small flotilla was maintained at Kotri under the command of an officer of Indian Navy. From 1852 onwards a fortnightly postal mail service was started between Karachi and Multan using the above mentioned flotilla boats. In 1856 – three before Indus Flotilla was established – another company called the Oriental Inland Steam Company obtained a yealry subsidy of Rs 50,000 annually from the Government. It started its business in 1858 with a capital of 250000 British Pounds for the purpose of navigating main rivers of India with “steam Trains” consisting of trains of barges drawn by powerful steamers but this company collapsed due to mismanagement and all of its fleet was sold by 1869. It is said that river currents in Indus also proved too strong for the lighghtly built steamers of Oriental Inland Steam Company and played a role in its fast demise. In 1859, another flotilla was organized which later became to be known as Indus Steam Flotilla. Its charter was to cooperate with the Railways which at that time was under construction between Karachi and Kotri. As depth of water channel was quite shallow in Indus Delta, the terminal of Indus Flotilla was stationed at a small city called ‘Jhirk’. This city is now a small blip on Pakistan’s national highway N5 but in the days of Indus Flotilla Company, it was the most modern river navigation terminal of the day. 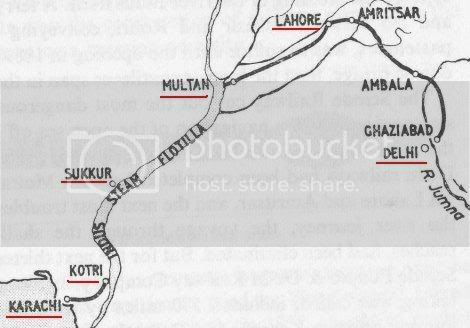 Click on the map below to see the larger image and note the location of Jhirk (spelled as Jerruck) on the banks of River Indus. Cargo coming into Indian subcontinent was first unloaded at Karachi’s kimari harbor and then loaded onto small boats. These boats then used to take a circuitous route through several channels of Indus River Delta to Jhirk terminal on the banks of Indus. At Jhirk, cargo was transported to Indus Flotilla steamers, which took it upstream to Multan and Kalabagh in Northern Punjab/NWFP. 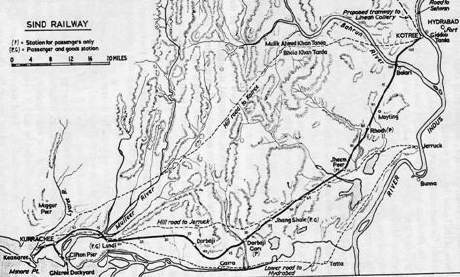 In 1859, a Railway Line was opened from Karachi harbor to present day Gizri Creek and it reduced the cargo journey of small boats by several kilometers. 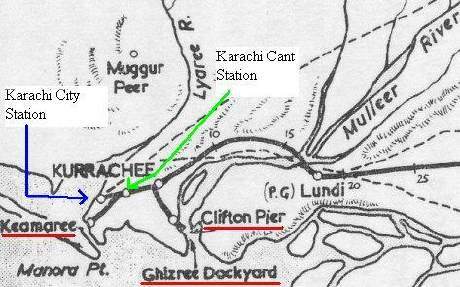 The map above shows the location of Kimari harobr (then spelled as keamaree) and the railway route to Gizri Dockyard (then spelled as Ghizree). This Gizri dockyard was located at present day Marina CLub in Defense, Karachi. While we may be digressing a bit from topic, it may still be worthwile to mention that for years the famous Sindhi educationist, Hassan Ali Effendi was employed at Indus Flotilla Company in Jhirk. Hassan Ali Effendi’s job description included keeping track of incoming and outgoing boats as well as accounting for the firewood used by the boats. Firewood was used by the Indus Flotilla as a fuel for the steamers. 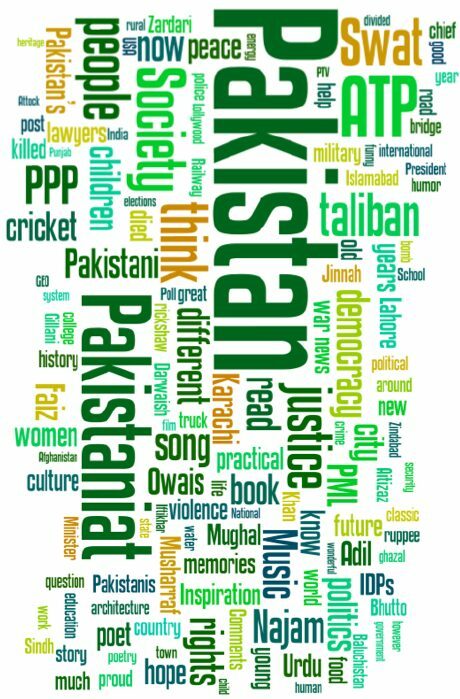 In later years Hassan Eli Effendi founded the famous Sind Madrassa-tul-Islam in Karachi, where father of the Nation, Mohammad Ali Jinnah became a student in 1880s. In 1861, after the Karachi-Kotri railway link opened, cargo was shipped by train to the banks of Indus at Kotri. The steamer terminal at Jhirk lost its importance as all the major cargo was shipped to transferred to Indus Flotilla at Kotri and this saved almost 250 km of river travel. By 1862, Indus Flotilla Steamers were running all the upto Makhad (A city downstream of Attock) in Indus and their Punjab operation was called Punjab Flotilla for a while. By 1865, Railway Line had connected Multan with Delhi via Lahore and Amritsar. Look at the map below. 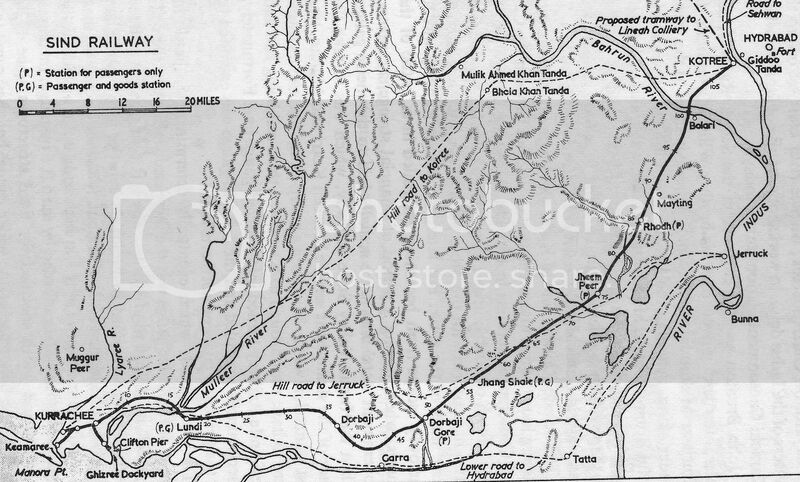 The reason I want to share this map here is to show how the cargo was moved from Karachi to Delhi via rail and river. Trains brought cargo from Karachi (kimari) to Kotri. From Kotri, steamers took cargo to the banks of River Chenab near Multan and from there Railways took it all the way up to Delhi and the rest of India. This was however a very inefficient way of transporting cargo, as it used to take 40 days to cover a distance of 945 km between Karachi and Multan via river Indus. The river boat company that moved this cargo was called the Indus flotilla. Indus flotilla used boats built in Birkenhead and London and was run by an Englishman named John Brunton. Brunton later became the Chief Engineer of Karachi-Kotri railway line project too. He also got heavily involved with Karachi Tramway Project. In 1878, Karachi was connected to Lahore via railways and Indus Flotilla lost its importance as the essantial means of coummunication. The railway-flotilla was abolished in 1882-83 but the steamers of Indus Flotilla continued to work for many years after that with diminshed business. Oxford University Press (Delhi) have just accepted a book of mine for publication – it’s called Steamboats on the Indus – and I would like to include your photograph of the ’Indus Flotilla steamer moored at Kotri’ as an illustration. Basically, I need a high-definition scan of the photograph. Could you help me trace the original photograph? I should be most grateful.